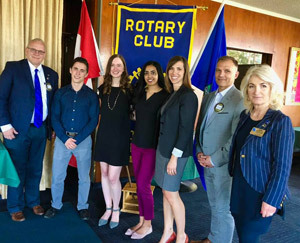 The Rotary Club of Edmonton West is proud to have created one of the largest scholarship funds available to University of Alberta students. Here is its story, and what the George Grover Scholarship looks like today. Upon the death of Rotarian George Grover, a well-respected member of the Rotary Club of Edmonton West, Rotarian Dave Turner believed that the high ideals and ethics held by George should be remembered in a suitable manner. George was a retired Real Estate Professional, so David contacted Rotarian Art Jones, predecessor to Rotarian Ron Hutchinson in both membership with our Rotary Club and in the position of Executive Director of the Edmonton Real Estate Board, to discuss a suitable project. They decided that a scholarship fund to assist in the education of real estate professionals would be suitable. Art agreed to contact the Edmonton Real Estate Board, the real estate industry, including the three professional associateions of that industry the George had belonged to, plus the Grover family, to see if there was interest in developing the scholarship memorial. Upon receipt of immediate, positive interest from all contacted parties, Art and David approached the Board of Directors of the Edmonton West Club to determine if the Club would spearhead the project. A committee was quickly formed. Rotarian Jerome Martin, then an Associate Professor with the Department of Extension of the University of Alberta (real estate studies were offered by that Department) approached the Dean, Dr. Don Weideman, and the process began in earnest. By the time the scholarship program was documented and implemented, funding of about $65,000 had been raised. This was sufficient to fund 4 to 7 annual scholarships to real estate professionals in an amount of $400.00 each. Scholarships were granted for several years, but then the real estate studies course ceased to be offered by the University of Alberta, and quietly the scholarship fund became inactive. Six years ago, David Turner wondered aloud about what had happened to the fund. He approached Jerome Martin, who enlisted Ron Hutchinson to assist in locating the fund. It had been well managed by the University of Alberta Administration, and had grown to nearly $500,000. A new committee of interested stakeholders, anchored by Ron Hutchinson, worked to develop a replacement scholarship offering. It was decided that all students of the University of Alberta would be eligible, so long as they were registered in second year programs or above. The successful applicants would have to excel in their community service activities (give something back to the community) and have reasonably high academic achievement. The fund has now grown to $535,000, and this enables us to award three scholarships worth $7,500 each year. Over $100,000 has been awarded to date. This makes the George Grover Leadership Scholarships second only to the Peter Lougheed Scholarship for monetary value of awards given by the University of Alberta. Current students may apply for the fund by applying for Undergraduate Leadership Scholarships. Visit the University of Alberta's site for more information on applications.